Vinpro has estimated that the 2018 wine crop is 1,220,920 tonnes, which is 15% smaller than in 2017 but larger than had previously been predicted. Credit: Pixabay. 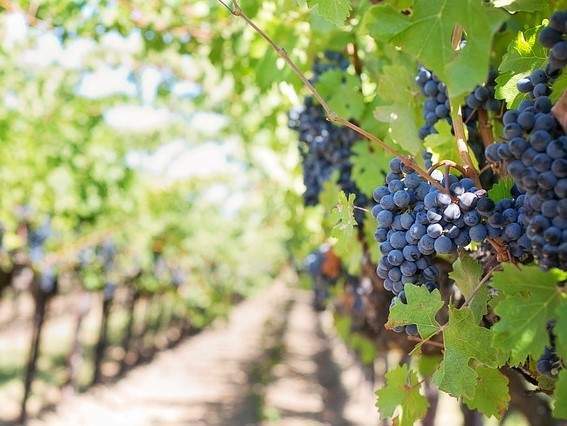 Non-profit wine industry body Vinpro has estimated that the 2018 wine crop is 1,220,920 tonnes, which is 15% smaller than in 2017 but larger than had previously been predicted. The harvest for the year is expected to amount to 948.3 million litres with an average recovery of 777 litres per ton of grapes. All of the country’s wine-producing regions except Breedekloof recorded a smaller wine crop than 2017 as a result of a combination of water shortages and frost damage. The Olifants River region suffered the most with its water allocation from the Clanwilliam Dam being 20% of the region’s normal allowance. The Northern Cape region, which had sufficient water supply, saw lower production than in 2017 as a result of frost damage early in the harvest season. Lower rainfall was experienced in all regions: 20% of the average for Klein Karoo and below 50% for Olifants River, Breedekloof, Paarl and Swartland. However, dry, warmer weather experienced in the 2017/2018 grape growing season helped to produced healthy grapes without pests or diseases and small berries with more intense flavours. Greater variation between night and day temperatures during the ripening stage helped with colour and flavour formation. This caused producers and exporters to be positive about the quality of wines made from the 2018 harvest. Viljoen said: “Smaller berries usually have good colour and flavour intensity and this, along with cooler weather during harvest time relieved some pressure on vines and bode well for quality. South Africa is the eighth largest wine-producing country worldwide, making approximately 4% of the world’s wine. Wine contributes R36bn ($2.87bn) to the country’s GDP and employs around 290,000 people.